Five years overdue, after three term renewals since 2013, I finally had the chance to take part in Lebanon’s parliamentary elections. At age 26, I had the chance to take part in the sacred ritual of placing the enveloped piece of paper into a plastic container, which alone – for some reason – is often seen as this as the sole indicator of a free society… but I digress. 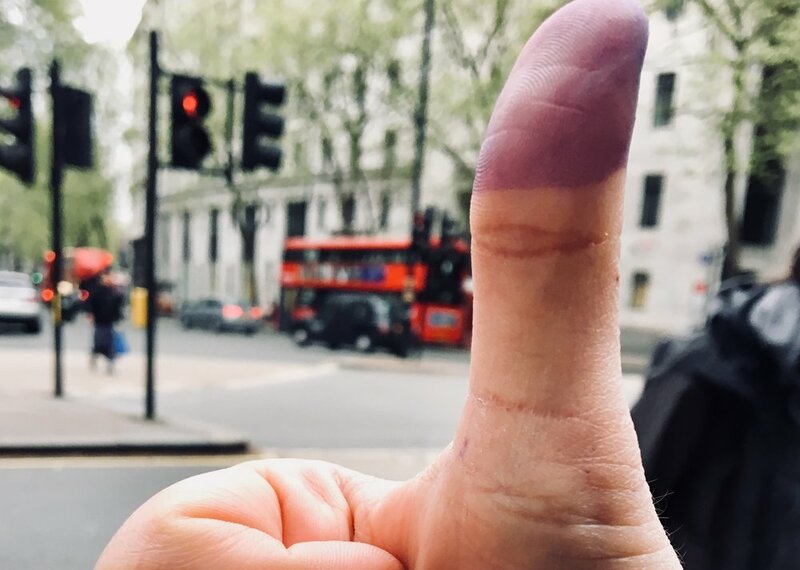 I participated in the voting process for the first time in my life, and I did so from London, home of infamous Parliament verbal spats, the Brexit referendum, and Ed Balls Day. Significantly, this was the first election where several Lebanese embassies have opened polling stations for the diaspora. Naturally, I decided to take part. I was curious about the experience and wanted to see it first-hand. Having registered last November – and stupidly giving all my personal information away to the foreign ministry as a result - I dragged myself from one side of London to the other to vote. Indeed, that morning of April 29, the embassy in the posh neighborhood of Kensington in West London bore a closer resemblance to home on April 29, 2018. I’m not talking about the elections just yet – I’m talking about the presence of Lebanon’s political parties and their color-coded outfits. After walking through the compound passing several other embassies (Kuwait, Saudi Arabia, Japan, France…), I was greeted by two men holding large polystyrene boards of the map of Lebanon carved into electoral districts. Each electoral district had the name of the list you were supposed to vote for if you supported their parties. One man wore green, and the other wore red promoting a party that is often represented by the white color (need I say more?). “Do you know who you’re going to vote for?” they asked almost simultaneously. They didn’t seem happy that I just wished them a good morning and stood in line outside the gated entrance to the embassy. Signs all over the compound said “no photography” but everyone – apart from the bewildered embassy security guard – was taking pictures: a political rainbow of selfies, mostly dark green, orange, and red. It was not very crowded, which I found surprising given the all the hullabaloo over the elections. But in all fairness, it wasn’t even noon yet, and polls were open in London until 10PM that night. It took a while for us to get in, because even though we registered online, the database was printed out and put in a binder. Yes, they were flipping through pages and crossing names off, and the staff involved forgot after a while that they organized people based on – in my case – two smaller districts joined together. But, it’s okay. We haven’t had elections in 9 years, and we’ve only had a little over a year to get things together for this new vote law. What do I know right? A few steps after walking through, there was another queue of apparently frustrated voters. This is where things got more interesting. Some other representatives of political parties were there too, wearing light blue scarves and hats trying to calm people down with the embassy staff and volunteers. They were letting people go through in clusters, and not based on who was standing first in line. It seemed they were getting people in based on voter districts depending on which lines in the following room were more crowded. Moments after I stood in line with them, I was let in after a mere few minutes while twenty or so people stood. Apparently their voting districts were crowded and mine wasn’t. Walking in, I told them that I agreed with them and that I have nothing to do with how things are run. A few laughed, one wearing white paraphernalia of a big political party; I wonder if he still would have laughed if he knew his party’s leader once nearly got me fired from a previous job? I walk into a medium-sized tension fabric building with … more queues. It was crowded with TV cameras and reporters all over the place, despite it being very small. There were four queues that led into smaller rooms, each representing a cluster of districts: a tent within a tent if you will. It was crowded, and people were frustrated, especially in one line, which grouped four South Lebanon districts together. My line was tolerable: Aley, Chouf, Jbeil, Baabda. Considering that the first two are a joint sub-districts, it was less of a hassle than the other lines. A lady pops out of the tent within a tent, asks me for my Lebanese ID or passport … again? Perhaps it was now my time to vote. It wasn’t. As I walked into the tent with her, I was greeted with a choir of gasps. The lady wasn’t there alone; there were members from various political parties sitting down and crossing out names of people going into vote. It was, of course, the usual: the blue, the green, the two white parties but wearing red and navy blue, and the orange. There was also a man in a grey suit without a tie next to them – unbranded; make of that what you will, but I think I can safely assume which party he represented. There were also two EU observers, who, to be completely honest, looked like they had no idea where they were nor what they were doing. So I walk back out, and people were complaining about how slow the process was. It took about 4-5 minutes for people to have their documents registered (for a second or third time) and then to vote. In theory it should be very simple: you go in, sign your name off, vote for the list and preferred candidate you like the most or hate the least, put the secret ballot in the box, walk out, and take a picture of yourself and write a caption about how you’re suddenly changing the world. An elderly man next to me was losing his patience, until a representative from a political party justifying it comforted him. “It’s just how it’s done!” he said. It was finally my turn. I walk in. Think of it like walking down the aisle at a church, except the aisle is narrower, and to your left are observers from political parties and two EU observers looking at you, and to your right are two embassy staffers, one who also looked half-asleep. They ask again for your registration number and district to confirm your identity (this was getting very, very annoying). Literally, a few steps away was not a booth, but more like a podium with raised fronts and sides; in all fairness, nobody could watch, but it was awkward that all these people were literally in my line of sight. I voted, sealed the ballot in the envelope, put it in the box, had my right thumb drenched in a jar of ink, and that was that. Some good friends of mine who went to vote later that day told me that the lines were even bigger, and some political party representatives joined in taking part in giving people courtesy coffee. Looking back at it, I wish I tried to sneakily take pictures… but with all the weird looks I was getting because I was eagerly observing how everything went, I figured I’d rather have more to say then very little with a few pictures. However, I do encourage you to take pictures to expose corruption, fraud, violations, and so on. So, all in all – my take on the voting experience and elections in Lebanon? Free? Somewhat. Fair? Nope. Entertaining? Very much so. I think the biggest victory in the elections has already happened: people are talking politics again beyond the routine discourse. The momentum that was built following continued term renewals since 2013 and the garbage protests in 2015 played a huge role. While some candidates did bring up some of Lebanon’s most pressing human and economics rights issues, it was also grassroots collectives and individual activists who pressured candidates to do so. A huge victory in my opinion is the formation of campaign monitoring collective Mist3idin, which have interviewed – or at least tried to – every single independent candidate, and rated them based on various issues, mostly on human and civil rights. That kind of grassroots organizing and effort shows that there is an increased interest in political participation and social justice. All things considered, I think they did a great job. I also think it’s great that Manal Kortam ran a mock campaign as a Beirut candidate for a Palestinian seat. Apart from news stories of clashes taking place in some of Lebanon’s refugee camps, notably Ain el-Hilweh in South Lebanon, we tend to forget that we have a refugee population that has lived for generation on Lebanese soil as second-class residents. This is obviously something that has never been brought up and discussed. Finally, while it sounds like a revelation that Lebanon is holding parliamentary elections in a region blighted by war, occupation, and authoritarian rule, it’s important that we don’t set the bar low for Lebanon, especially when it comes to social justice and equality. A large amount of the population in Lebanon doesn’t have the right to vote or take part in the political process in the country; the Lebanese nationality is only passed paternally. That is just absurd. Meanwhile, third-generation populations in the diaspora selected on a sectarian and class basis have been urged by the foreign ministry to register to vote. I think they have their priorities mixed up. There’s also the fact that the voting age in Lebanon is still 21; it’s about time they lower it to 18. While it is exciting that many Lebanese in the diaspora didn’t have to fly home to vote, there were numerous cases of corruption and fraud documented by the Lebanese Association for Democratic Elections (LADE). One particular case they documented in London is the large number of Amal Movement monitors in the voting polls, one who walked in with a voter and took a picture of him, despite embassy staff telling him not to do so. There is also the bizarre case of some Lebanese consulates canceling voting without prior notice, despite being open for registration. A friend who asked to be unnamed told me that his parents in Gambia registered to vote in the Lebanese consulate there. They called the consulate the day before the elections for logistical information, only to be told that due to too little people registering, the consulate would not be open for voting. There’s also the fact that elections were supposed to take place in 2013—that little thing. Elections often took place in a timely manner during the civil war, and it’s a right to have timely elections. What gives? If you’re not going to vote because nobody convinced you, then that’s fine; it’s your right after all. But, if you are going, be your own journalist or detective. Take a look around and document what you see around you. Use your cellphone cameras or audio recorders. I look forward to seeing those. If you don’t feel comfortable posting it yourself, send it over to LADE under the condition of remaining anonymous. It’s the right thing to do. Democracy isn’t limited to voting. Oh, and stay safe. Fights often break out on election day, and we saw numerous ones in 2009. Clashes have already been documented, including one in the Tarik Jdideh neighborhood in Beirut between Prime Minister Saad Hariri’s Future Movement and the small pro-Hezbollah Islamist group Al-Ahbash (video below). They threw rocks and shot at each other, and several were rushed to the hospital.